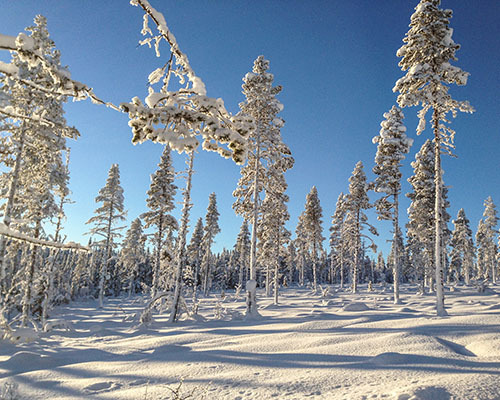 Our short tours are a great way to get a feel for the beauty of the Swedish Lapland wilderness. With a choice of day or evening adventures you can enjoy the exhilaration of a dog sled ride as you are driven through the forest and out across a frozen lake by 12-14 enthusiastic huskies. Driven by an experienced guide a short tour is the perfect trip for all the family! Book directly online from this page or contact us if you have any questions. A magical daytime adventure through the forest and across a frozen river, sitting on a sled pulled by 12 Alaskan Huskies. Imagine gliding through the sparkling wintery landscape of Lapland by dog sled; something you will have dreamed of as a child. The glitter of snowflakes is all around and the cold air is filled with the warm breath of the dogs, panting as they run, winding their way along an exciting, yet secluded, forest trail. Through the trees you get your first glimpse of our lavvu, a traditional Sami style tipi retreat, where you will warm yourself once more around a roaring fire and with a steaming mug of hot chocolate or coffee in your hands. The scenery that surrounds you is stunning and you may even see reindeer or moose on your adventure. This is the arctic winter at its best and we pride ourselves in offering an exceptional and high quality experience for you and your family. 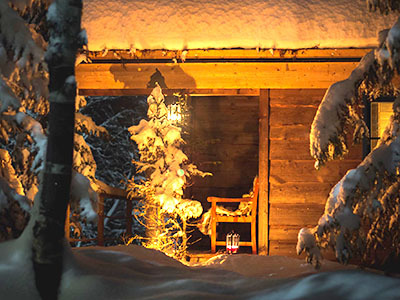 Away from the crowds, yet just 15 minutes drive from Kiruna centre, our kennel is also our home; a rustic home, hand-crafted and built with the environment in mind. It provides an escape from the bustle of busy lives and for a short time will transport you to the wintery wonderland of fairytales. Our dogs love it too and we are sure you’ll notice how happy and excited they are to meet you. They love cuddles and there will be plenty of time for you to get to know them and some of our young puppies. Daily departures from the beginning of December to the beginning of April, subject to availability. This is a ‘sitting’ experience with up to four people sitting on a large sled driven by an experienced guide. Occasionally it may be possible (or necessary) for five people to sit on one sled but this is only in exceptional circumstances. 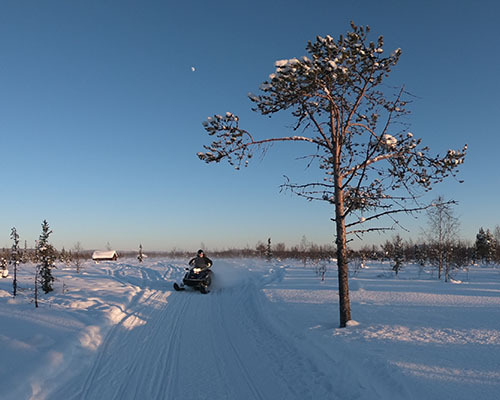 Pick-up and drop-off is at any centrally located hotel in Kiruna city or the central Folketshus. Please be ready 10 minutes in advance of the departure time stated; in consideration of our other guests, we cannot wait for late arrivals. We will provide you with insulated outerwear during your experience and we stock adult sizes ranging from ‘extra small’ to ‘extra, extra large’. Boots are stocked in adult sizes ranging from 36 (EU) to 46 (EU). If you think you may require a size outside of this range, please contact us so we can make the appropriate arrangements. Small children are provided with insulated ‘jumpsuits’ often worn over their own sweaters or coat (sizes 110-160cm). Children’s boots are stocked in size 11 and up. Minimum age for children is 4 years. The child’s rate is applied to anyone under the age of 12. Please respect that proof of age may be required. If the temperature drops below -30C (-22F), it may be necessary to shorten the trip for your comfort. Our guides usually speak English as a recognised international language but we have guides that also speak Slovak/Czech, and Danish. Guide gratuity/tip is not included in the price and although optional is greatly appreciated. Minimum 2 people. Individual bookings accepted. In the event that only one person is booked on the tour, we reserve the right to cancel the tour and issue a full refund or arrange an alternative date. Refunds & changes: Unfortunately, we cannot offer a refund if you decide to cancel within 48 hours (for any reason, including weather or unforeseen changing travel plans). If you cancel in excess of 48 hours, we offer a full refund minus a 10% administration charge to cover our booking fees. If in exceptional circumstances we have to cancel your tour, we will refund you 100% of the cost with no administration deductions. If you would like to change your booking, we will do our best to accommodate such changes but we reserve the right to charge a 300SEK change fee to cover any additional costs incurred. The evening Aurora Hunt by dogsled is the perfect way to increase your chances of spotting the Northern Lights. The evening Aurora Hunt by dogsled is the perfect way to increase your chances of spotting the Northern Lights whilst enjoying a thrilling dog sled ride. Immerse yourself in the dark wintry nights of Lapland and escape the city lights by sitting on a big sled pulled by a team of excitable yet friendly Alaskan Huskies. The trail winds its way through pine and birch forest down to the famous Torne River where you can see the night sky stretching far infront of you. At our half way point we stop at a traditional Sami-style tipi, lavvu, for a warming drink and homemade cake. Here you can choose to take comfort and warmth from the open fire or, if luck is on your side, you can marvel at the display of Aurora outside. Daily departures from the beginning of December to the middle of March, subject to availability. The Aurora Borealis (Northern Lights) are a natural phenomenon and therefore not guaranteed. We will provide you with insulated outerwear during your experience and we stock adult sizes ranging from ‘extra small’ to ‘extra, extra large’. Boots are stocked in adult sizes ranging from 36 (EU) to 46 (EU). If you think you may require a size outside of this range, please contact us so we can make the appropriate arrangements. Small children are provided with insulated ‘jumpsuits’ often worn over their own sweaters or coat (sizes 110-160cm). Children’s boots are stocked in size 11 and above. Refunds & changes: Unfortunately, we cannot offer a refund if you decide to cancel within 48 hours of the tour (for any reason, including weather or unforeseen changing travel plans). If you cancel in excess of 48 hours, we offer a full refund minus a 10% administration charge to cover our booking fees. If in exceptional circumstances we have to cancel your tour, we will refund you 100% of the cost with no administration deductions. If you would like to change your booking, we will do our best to accommodate such changes but we reserve the right to charge a 300SEK change fee to cover any additional costs incurred. 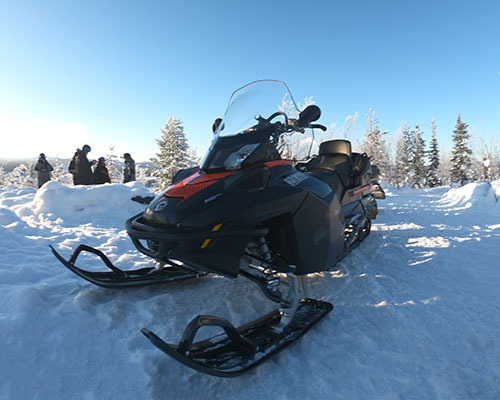 Feel the surge of engine power as it fills your body on a thrilling ride through the frozen landscape. 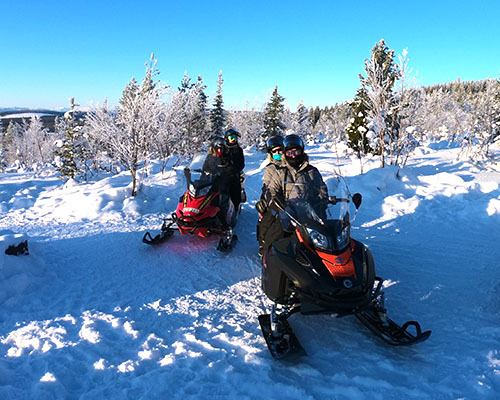 You will be given instructions on how to drive the snowmobile before setting off for a thrilling ride through the frozen landscape and out across the frozen Torne river to a lovely viewpoint. Along the way we stop for a welcome hot drink and cake. We specialise in exclusive tours with just 2-4 people on each tour. If you want to book more than four people, please contact us. Minimum 2 people. Available December to early April. This is a guided tour and you will need a full drivers licence to take part. Drivers will be required to sign an insurance waiver and we will require a credit card authorisation for 8000sek (maximum) to cover the insurance excess in the event of an accident that is your own fault. Pick-up and drop-off is at any centrally located hotel in Kiruna city or the central Folketshus. We will provide you with insulated outerwear during your experience and we stock adult sizes ranging from ‘extra small’ to ‘extra, extra large’. Boots are stocked in adult sizes ranging from 36 (EU) to 46 (EU). If you think you may require a size outside of this range, please contact us so we can make the appropriate arrangements. Minimum age 18 years with a full driver’s licence. Children are welcome as a passenger. 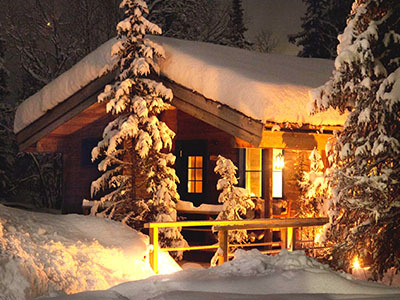 A combination of the two most popular past times of the locals; an evening dog sled ride and private sauna (min 2 persons). The Sauna Sizzler starts with a short, 15-minute transfer from town to our kennels and as you turn towards your destination you can marvel at the Lapland landscape ahead of you. Your excitement is sure to build as your eyes spot the dog team for the first time. They will be raring to take you on a magical, twisty trail through the forest and you can sit back and relax as light gives way to the dark and the night sky hopefully reveals the northern lights ahead. After 30-45 minutes, you will return to the kennels with anticipation of a warming sauna that will await your arrival. This is a private sauna experience for your group of 2-8 people, so you can feel your most relaxed as the heat soothes all of your troubles and stresses away. The cold outside only enhances the experience and every so often we’re sure you’ll be brave enough to pop your head outside and even roll around in the snow which can be most invigorating! Inside the sauna is a wash and changing area. We provide everything you might need including towels, a spa basket full of quality wash scrubs and gels and cool refreshments. The tour ends with a return transfer to your hotel in Kiruna town. kr5.600 total (3-4 people), kr8.400 total (5-6 people), kr11.200 total (7-8 people). Departures: Every Monday, Wednesday and Friday from December to April, subject to availability. No discounts for children. Not suitable for young children (we recommend at least 8 years of age). Minimum 2 people, maximum 8 people. Individual bookings are not accepted unless you pay for 2 persons. This is a private sauna experience for your group only. This is a ‘sitting’ dog sled experience with up to four people sitting on a large sled driven by an experienced guide. Occasionally it may be possible (or necessary) for five people to sit on one sled but this is only in exceptional circumstances. If the temperature drops below minus 30 degrees C, it may be necessary to shorten the trip for your comfort. Our guides usually speak English as a recognised international language but we have guides that also speak Slovak/Czech, Dutch, French, Spanish and some Swedish. Guide gratuity/tip is not included in the price and is optional (and greatly appreciated!). Refunds & changes: Unfortunately, we cannot offer a refund if you decide to cancel within 48 hours (for any reason, including weather or unforeseen changing travel plans). If you cancel in excess of 48 hours, we offer a full refund minus a 10% administration charge to cover our booking fees. If in exceptional circumstances we have to cancel your tour, we will refund you 100% of the cost with no administration deductions. If you would like to change your booking, we will do our best to accommodate such changes but we reserve the right to charge a change fee to cover any additional costs incurred.